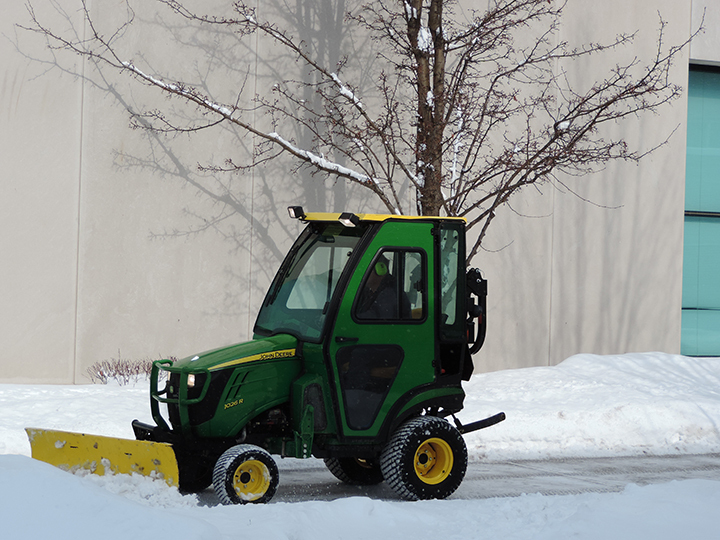 A groundskeeper plows snow from a sidewalk after a snow. The morning after a light dusting of snow fell Tuesday night, Feb. 25 (about an inch), IU South Bend’s six groundskeepers used 220 gallons of de-icer and at least 60 bags of salt to make sure campus was safe for students by 11 a.m.
During a typical winter day, the custodians are moving piles of snow away from the doorways at 4 a.m., according to Michael Prater, director of facilities management. Next, the groundskeepers start clearing campus at 6 a.m., pushing snow off the sidewalks then looking for hazardous slick spots that might need salted. If the temperature is less than 28 degrees (as it often has been this winter), that means it’s too cold for salt, so workers switch to liquid de-icer. In July the office buys the salt to ensure a good price, and sometimes it’s delivered from as far as Indianapolis to be stored on campus until it’s needed. The first goal is to have the campus clear by 8 a.m. when classes start for the day. That includes crosswalks, sidewalks, handicap spots (particularly those along Mishawaka avenue) and the third story of the parking garage. Prater said that on Jan. 27, when campus was closed around 10 a.m., the walkways were clear and campus was ready for students. “Some of the days when the campus was closed because of the temperature and county mandates, we were ready,” Prater said. It wasn’t just an IU South Bend call to make, he said. The decision-making process went through the chancellor’s office, IU South Bend’s chief of police and the county emergency management director. The Bloomington branch of IU also had to be notified. The hardest part of the day, according to one groundskeeper, is waiting for the sun to come out. When it snows all day and clouds keep the sun from interacting with the salt, it’s near impossible to keep campus cleared, according to Prater. Sometimes after eight-and-a-half hours, Prater said, the office just has to make the call at 2:30 p.m. that they aren’t going to catch up and it’s time for the groundskeepers to go home. Those same six groundskeepers are on call all weekend depending on if there are any events such as conferences, plays, recitals, basketball games, gallery showings, lectures or community events.